If jockeys lean a few inches too far forward or backwards, they fall — that’s the dynamic imbalance. The speed of the horse creates the ballistic opportunity. In either case a jockey can be sent flying over the head of the horse. A rider airborne at 40 mph hopes he’s not met by a railing or a hoof. If he’s lucky enough to land on the track unhurt, he must hope that he isn’t trampled by trailing horses, whose hooves strike the ground with as much as 3,000 pounds of force. Sometimes a rider, instead of being thrown, falls with the horse. That happened to Red Pollard, Seabiscuit’s famous rider, in the San Carlos Handicap in February 1938. Pollard was riding Fair Knightess around the far turn when the horse He Did slowed down in front of him. Fair Knightess tripped over the back legs of He Did and crumpled into a somersault, crushing Pollard. A trailing horse, Mandingham, tried to leap over Fair Knightess and might have succeeded if Fair Knightess had not stood up. Mandingham’s flight ended when he smashed into her, hurtling Fair Knightess back to the ground and on top of Pollard again. Fair Knightess and Pollard did not get up. The rider was rushed to the hospital, where they treated a crushed chest, broken ribs, a broken shoulder, a shattered collarbone, severe internal injuries, and a concussion. Fair Knightess injured her back, but eventually recovered. “Riders didn’t even have to leave the saddle to be badly hurt,” notes author Laura Hillenbrand. “Their hands and shins were smashed and their knee ligaments ripped when horses twisted beneath them or banged into rails and walls.” In the summer of 1938, Pollard was exercising an inexperienced Thoroughbred named Modern Youth when the horse spooked and broke through the outer rail. The horse tried to run between two barns but was moving too fast and smashed into one barn’s corner. Pollard’s leg was almost shorn off at the knee. 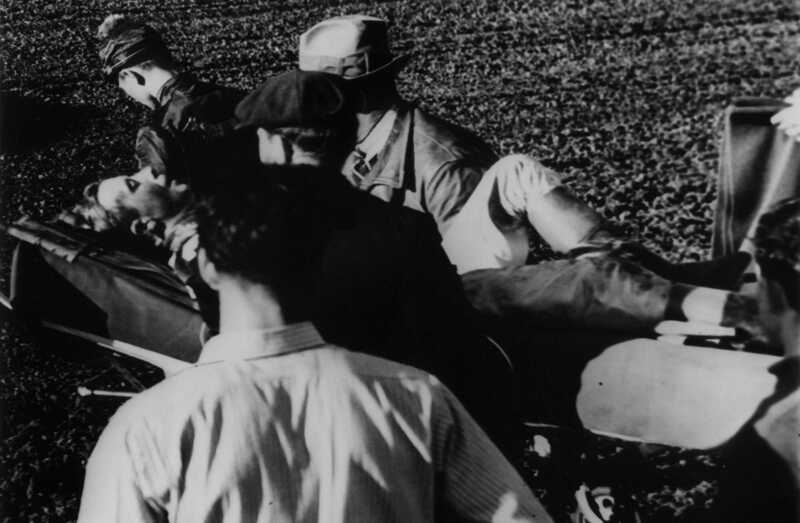 Between 1935 and 1939, nineteen jockeys were killed in racing accidents. 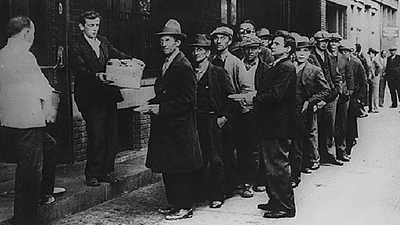 In that era jockeys did not wear flak jackets, goggles, and helmets. They did not have safety rails, or ambulances following them around the track. Tracks have made safety improvements, but that’s not to say the sport is now safe. The Jockeys’ Guild receives 2,500 injury notifications in a year. The average jockey gets sidelined by injuries about three times a year. A jockey’s life off the horse is grueling and, at times, dangerous. The spectre haunting almost every rider is extra weight. In the trade, the scale is sometimes called “the Oracle.” It’s an apt name — the scale decides which jockeys are light enough to be allowed to race. In the 1920s and 1930s, the imposts — the weight horses were assigned to carry in races — generally ranged from 83 to 130 pounds. A rider who was more than five pounds over the assigned weight wasn’t allowed to ride. In all but the highest stakes races, which allowed for higher imposts, and thus higher jockey weights, the riders had to keep their weight under 114 pounds. 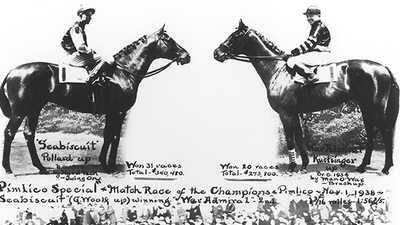 In the bush leagues, the lowest rung of Thoroughbred racing, most jockeys could only ride if they kept their weight below 100 pounds. To keep their weight down, riders like Red Pollard resorted to diets of as little as 600 calories a day. They would avoid drinking fluids then run in winter gear and rubber suits, using homemade diuretics to squeeze fluids from their bodies. Jockeys often became anorexic and bulimic, taking to the track weakened if not faint. 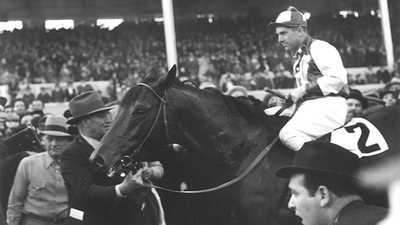 George Woolf, who rode Seabiscuit in his classic race against War Admiral, was heavy for a jockey. His weight was often in the 110-115 pound range, earning him the nickname “Old Lead Pad.” His high weight kept him from riding in most races, but his weight woes were compounded by another problem — Type 1 diabetes. Woolf faced a constant dilemma: how to eat enough food to keep the diabetes under control and at the same time keep his weight low enough so he was still able to ride. The balancing act made controlling his blood sugar levels nearly impossible, and sometimes the great rider seemed on the verge of passing out. One winter day in 1946, Woolf, then 35, agreed to run a weekday race at Santa Anita Park outside of Los Angeles. He had been struggling with his diabetes and wasn’t feeling well enough to ride. Into the first turn, fans saw the great rider slip from the saddle. Apparently, dieting and his diabetes conspired against him on the most dangerous place it could, a horse track. His head hit the track with a sickening thud. At the funeral, Gene Autry sang “Empty Saddles in the Old Corral.” He sang it for Woolf, but all the jockeys assembled that day understood that it might one day be sung for them.